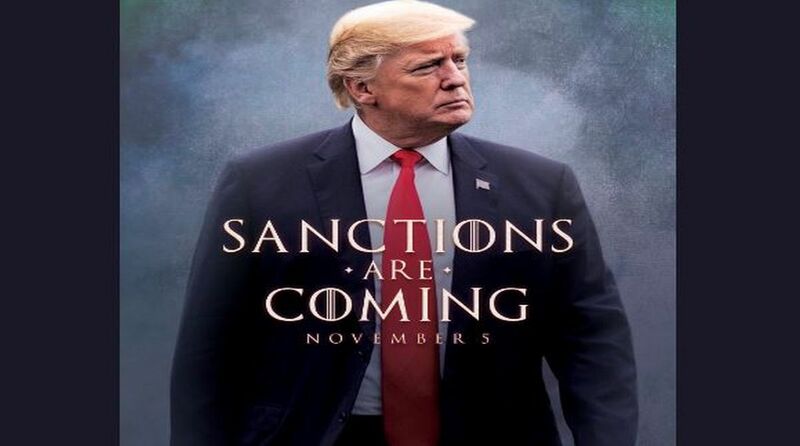 “Game of Thrones” fans are primed for the final season, but starring Donald Trump? Well not quite, though the president had a laugh at Iran’s expense Friday by posing in a GoT-style picture. Each “O” in the fictional Trump title is crossed by vertical lines, just like in the “Game of Thrones” logo. The words are superimposed on a picture of the president striding out of a foggy background or possibly the smoking ruins of a diplomatic battlefield. Trump was referring to a host of new sanctions set to be imposed on Iran by the United States after Washington ditched an agreement reached under Barack Obama’s administration to lift sanctions in exchange for controls over Tehran’s nuclear programs. As for HBO, it isn’t amused by Trump’s fantasy poster. “We were not aware of this messaging and would prefer our trademark not be misappropriated for political purposes,” said HBO in a statement to The Hollywood Reporter. Game of Thrones stars Sophie Turner and Maisie Williams too fired back at Trump’s social media post criticising his message. Sophie Turner followed up with a more disgusted approach writing, “Ew”. Trump, who followed his real estate career with a spell as a reality TV host, is no stranger to self-promotion, telling rallies that by every metric imaginable he is enjoying unprecedented success.